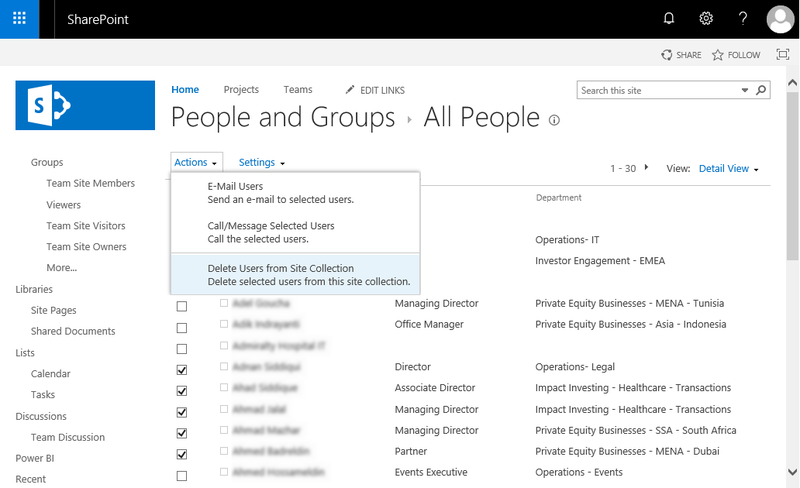 Problem: Deleted user accounts still appears in SharePoint Online People Picker! Root Cause: When a SharePoint Online user browse to a site, SharePoint creates an entry in "User information List" to cache the user information. SharePoint syncs this list from user profile when user create/edit/update/delete items. When the user is deleted in Office 365 Azure AD, their related entry in UserInfo list is not removed. How to Delete User from User Information List in SharePoint Online? This takes you to the "All People" View. Now you can select and remove users from this User Information List by Clicking on Actions >> Delete User from Site Collection, and then confirm the prompt. This deletes user from user information list in SharePoint Online. Orphaned users are those who doesn't exist in the authentication provider, such as Active Directory, but still be in the "User Information List" and appears in People Picker! Lets use PowerShell to remove user(s) from user information list in SharePoint Online. Write-host -f Green "Removed the User '$UserID' from $SiteURL"
How to Find Who Created a Site in SharePoint? How to Copy a SharePoint List using PowerShell? How to Change a Group Name in SharePoint Online?